23andMe, in collaboration with Pfizer Inc, is well on its way to enrolling 10,000 people living with Inflammatory Bowel Disease (IBD) to participate in research on this serious digestive condition, which includes both Crohn’s disease and ulcerative colitis. But we can’t begin our analysis of the data in earnest until we reach our goal. As we prepare to mark World IBD Day on May 19th, we want to thank all those who’ve joined 23andMe’s IBD study, making this research effort possible, and we want to draw attention to the goals of that research as well as some of what we’ve learned already. These are chronic autoimmune conditions, affecting more than 5 million people worldwide. The symptoms for IBD can be debilitating and include among other things cramps, pain, fever, loss of appetite, bowel problems and severe weight loss. Currently there is no cure. 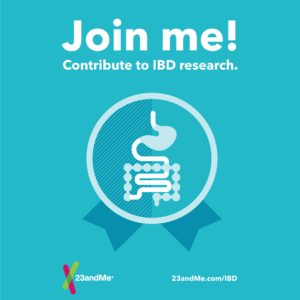 The goal of 23andMe’s IBD study is to find out more about the role genetics and environment play in the onset and progression of IBD. We also want to learn how those factors influence why individuals respond differently to treatments. More than a quarter of our participants report that a close relative also has some form of IBD, supporting the notion that the condition runs in families. Almost half of our participants have also been hit with a flare up of symptoms in the last three months. More than 40 percent said that among their symptoms is pain in their joints or swollen joints. While there are treatments, the effectiveness of those treatments varies and that is part of what our researchers want to understand with this study. The hope is that insight from this research will aid in developing more effective ways to treat the condition. So as we mark World IBD Day, take a moment to learn more about IBD and 23andMe’s ongoing research that we hope will change the future of this disease.